Bridge Partners announced today that it was named one of America’s Fastest Growing Private Businesses by Inc. Magazine for the fifth straight year. The Inc. 5000 list is published annually and recognizes the fastest growing, for-profit, privately-held companies in the nation. With a 3-year growth rate of 135 percent, Bridge Partners is also one of the fastest growing consulting firms in North America. 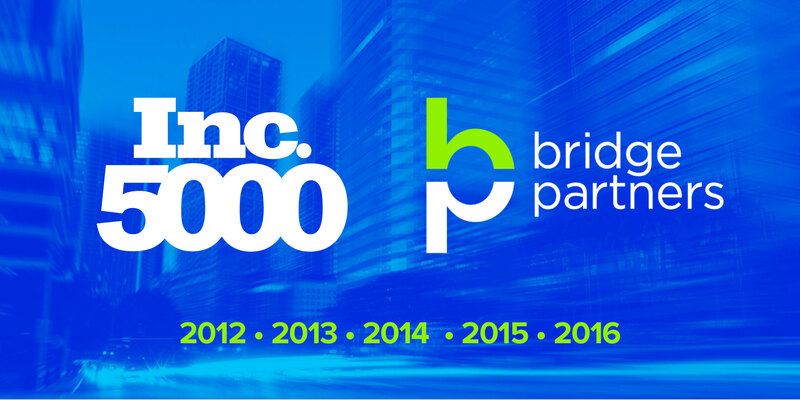 Bridge Partners lands on the #Inc5000 for the fifth straight year, as one of America's fastest growing private businesses. Founded in 2006, Bridge Partners has distinguished itself as a leader in business consulting and an employer of choice. Bridge serves a range of customers from start-up to the Fortune 100 from offices in Seattle, San Francisco, Chicago, and Texas.